3.3 Volt AC Switchmode 12 watt regulated power supply, with 3.3V 4 amp DC output, double insulated. This is a compact, high quality, 3.3V switchmode regulated power supply, double insulated, and LPE, 13.2 watts continuous with UL and international agency approvals. 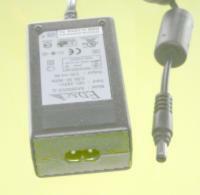 Close up showing the IEC C7 input connector. The unit comes with the power cord as priced. Agency Approvals UL, cUL, LPS, CB, TUV GS, CE, PSE JET, Double Insulated, for indoor use. Universal input switchmode power supply with fixed 3.3 volt output voltage, 4 amps or less.